This is one of our most popular fittings. A tow bar for Subaru Forester. The one fitted today is a quick release hitch style although a cheaper slightly lighter duty is also available with a bolt on goose neck. I will give a step by step guide as this is a bar well within the capabilities of the DIY fitter. Just one note of warning, if you have access to a rattle gun for undoing bolts don't use it on the bolts going into the chassis rails. These are often over torqued at the factory and you will find them difficult to refit if you rattle them off. If you remove them gently and slowly by hand with a socket you'll be fine. Remove and discard the bumper support in the centre of the bumper (pic). Drop the muffler from the 3 rear most rubber mounts. 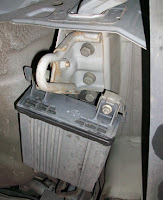 Remove the shipping hook and muffler mount from passenger side (pic). Remove the rubber mount from its bracket. Remove 3 nuts securing the charcoal box where fitted and let it hang (pic). Remove shipping hook (discard) and charcoal support from drivers side. Lift tow bar into position and fit with 3 bolts on passenger side and the 2 rear most bolts on drivers side. 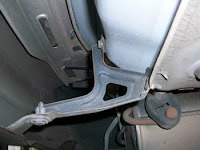 On the forward most hole on drivers side use the long bolt and spacer tube supplied to refit the charcoal box bracket. Then refit the charcoal box. Bolt the the rubber muffler mount from step 3 to the tow bar arm in the hole provided for it and refit the muffler (pic). 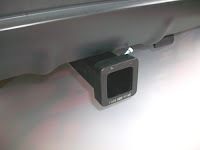 Fit the tongue on standard tow bar or hitch on quick release and your bar is pretty much done. The wiring is a doddle as Subaru have kindly included a socket which can be found tucked in the rear corner of the boot (pic). You can get a loom that plugs into here for about $50 but you will find most fitters will just use a universal loom and make their connections here where everything is provided in one place. 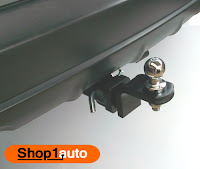 The towbar for the new Subaru Forester is a little bit more involved because it requires the removal of the bumper and a notch cutting in it to accomodate the hitch box. You are left with nice neat unit with towbar frame hidden up behind the bumper. The bar shown is a Hayman Reese unit which has a rating of 1400kg. . The fitting time is about 2.5hrs. 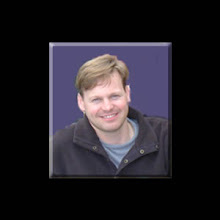 Please call the store on (02) 9817 1475 to confirm current pricing and schedule a install.